It is in New York where the largest corncob of the world is exhibited, in a museum showcase, but even those who have seen in it there are unaware of where it was grown. That corn was harvested in the outskirts of Jala, a small and rural village in the central area of Nayarit. The high plateau in that zone neighboring the Riviera Nayarit is famous for cultivating the most valued grain by Mexicans. From Xalisco to Ixtlan, you can enjoy a landscape that combines different natural habitats with the cornfields; but what has given fame to the region is the size of the corncobs that are grown here. The record belongs to the corn exhibited in New York, which measures 50 centimeters (19.69 inches) from grain to grain, without counting the cob. However, in this region you will not find a corncob smaller than 30 centimeters (11.81 inches) long, for the pride of the farmer who grew it. Each year, the communities of Jala and Xalisco celebrate corn in theirs patron saint’s days. Corn Festivals in both villages are organized to commemorate the first crops with a popular festivity in which corn has the leading role. However, gastronomy, culture and traditions constitute the true feast. Actually, what is celebrated is the Virgen de la Asunción (Assumption of the Virgin Mary) and this religious festivity was made to coincide with the pagan festivals. Dances and artistic presentations in public squares, cockfights, Mexican rodeos, and a wide variety of activities are programmed starting August 1st. Food stands, mainly, with corn prepared in different ways and products made from this grain are established in the streets and offer a striking taste experience. But the most important thing is the contest “The World’s Biggest Corn”, where the local farmers present their most beautiful young corncobs. The winner is the one with the largest size, which usually ranges between 35 and 40 centimeters (13.78 and 15.75 inches) from grain to grain, which means that, counting the leaves, we are talking about cobs that almost reach one meter in length. Your visit to Jala will allow you to enjoy the colonial architecture of the Mexican rural zones in its purest expression. The streets and buildings of this village have been protected by the Instituto Nacional de Antropología e Historia (National Institute of Anthropology and History) and to walk all over it is really an unforgettable experience, since it has preserved its essence in every single corner and not only in the main square, as it usually happens in other villages. This festival is the ideal excuse to visit Riviera Nayarit, to enjoy its traditions, culture y most typical gastronomy. The Jala Breed corn is cultivated in the lands that make the most of the sewage waters that leave the first rains of the year, called “cabañuelas”, which fall in January, and the fertility originated by the volcanic ashes left by the ancestral eruptions of the volcano El Ceboruco. 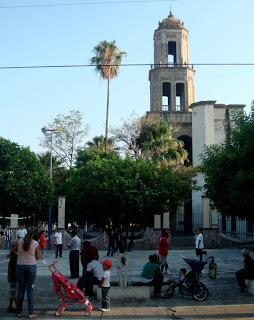 Jala is located in the south part of the State of Nayarit. It borders on the north with the municipalities of Santa María del Oro and La Yesca and on the south with the municipalities of Ahuacatlán and Ixtlán del Río. To get there, you should take the highway that goes from Tepic to Guadalajara and divert in the junction located about ten minutes before Ixtlán del Río. Currently, there are no lodging services, which is why our recommendation is to spend the night in Tepic, so you’ll be able to enjoy this celebration in Xalisco too, which is a village neighboring the state capital and venue of one of the two Corn Festivals that are held in the state.